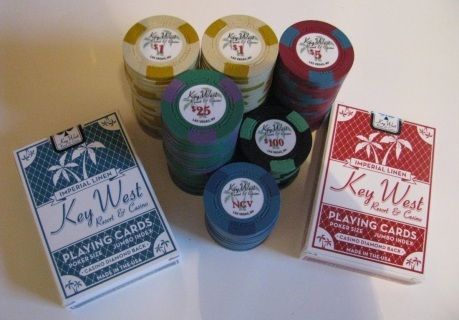 Key West $1 chips in white, blue or both! 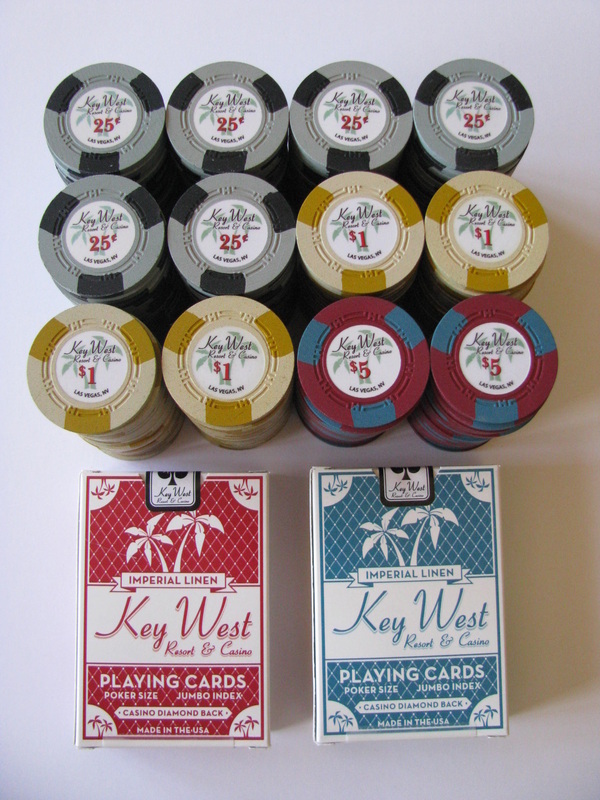 At the Key West, we've settled the debate about using white or blue for a $1 chip. We offer both! Our traditional white chip with gold 312 spots was one of our original denominations, and our new blue $1 chips are available for face value and redeemable. You get to pick your favorite chip color for your $1 chip. E-mail your choice here. Need odd numbers of different denominations? That's never a problem! At the Key West, you can order any number of any denomination you'd like. They don't even have to be even numbers. 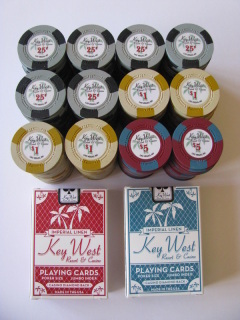 So if you'd like 300 Key West Resort & Casino chips, but would like to have 150 of one denomination, 75 of a different denomination, 50 of a third denomination, etc., we can do that. Simply email your request to orders@keywestresortcasino.com, click the address to send an email, or use our order form by clicking the clipboard on the right or the button below. After you place your order, we'll send an invoice to your PayPal account. Prefer non-denominated chips? 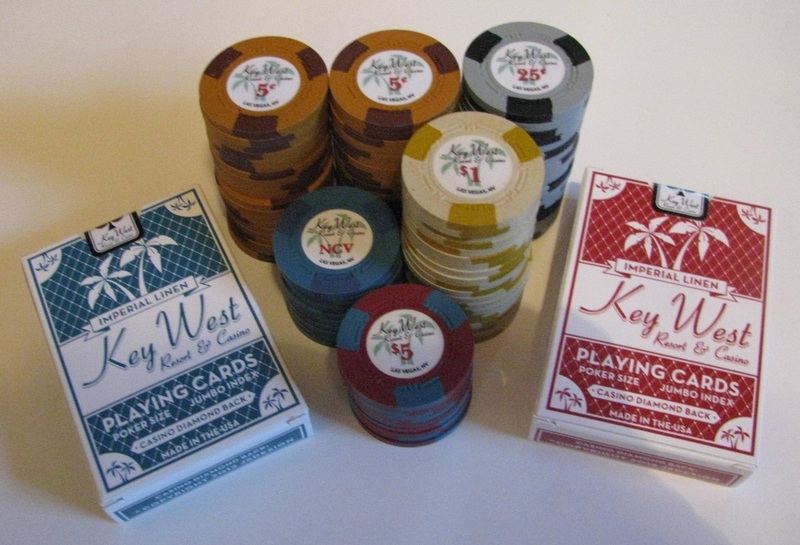 Our Key West solid chips feature solid colors and an elegant "reverse inlay," (white KW logo on a black inlay), all on the real, original H mold chip. 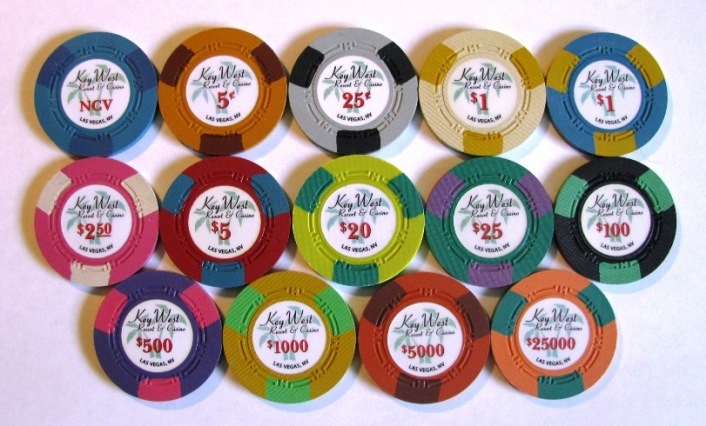 Created for the roulette table, these chips can "play well" on your poker table, too, and can even mix with denominated chips. Colors are light blue, blue, yellow, light green, pink and purple. Click the blue button to go to the roulette supplies page and order a sample set. Ten (10) solid clear plastic discs used to separate stacks of 20 casino chips in a dealer's rack for easy counting during "take and pay" procedures. 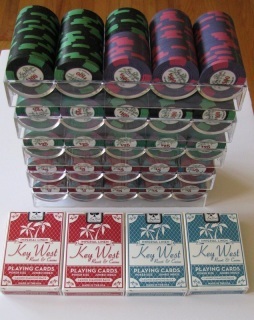 You can see this product in use in the Vegas-Aces.com video "How to Deal Blackjack," on our videos page under "Play." 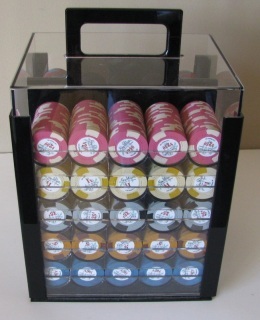 Our locking acrylic toke box is just like the ones on the side of the blackjack table at your favorite casino. 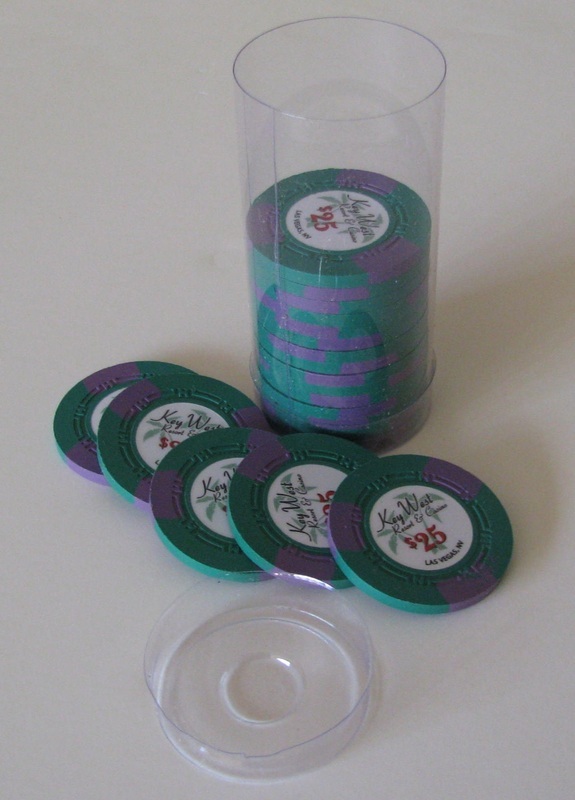 Drop dealer tips -- or "tokes," as they're called in the casino -- into the slot in the locking lid, and the tips will fall into the clear box in plain view of your players. The box has a sturdy J-hook to attack it to the side of your table. The box measures 9 1/2" tall, 5 3/8" long and 3 7/8" wide, and comes with two keys for the locking lid. 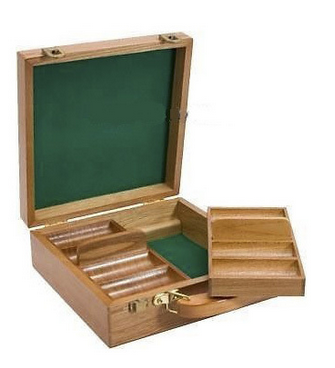 Our professional 12-row locking dealer tray is made of sturdy aluminum and finished in beautiful hammered gold color. 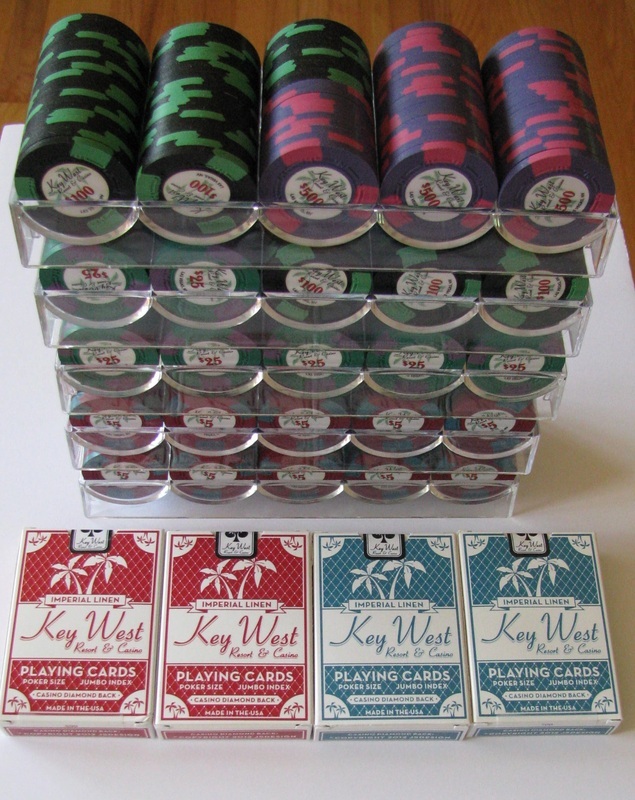 It holds 720 standard casino chips. 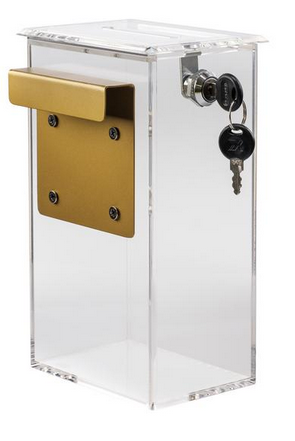 The lid has a clear acrylic window and locks into place. Unlock the lid and it lifts off, and your 12-row tray is lush with the surface of your table. 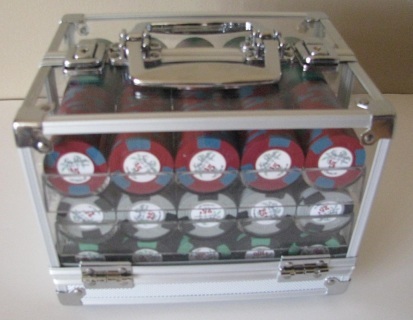 This tray is the real thing, and is identical to those used in the casino industry. 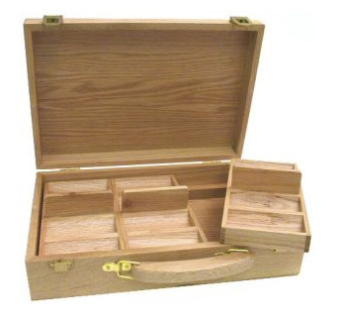 Each tray comes with two keys and measures 24" x 9" x 3" deep. It's made to drop into a table cutout measuring 21.5" x 8.5." ​To insure a good fit, we recommend cutting your table after receiving your tray. 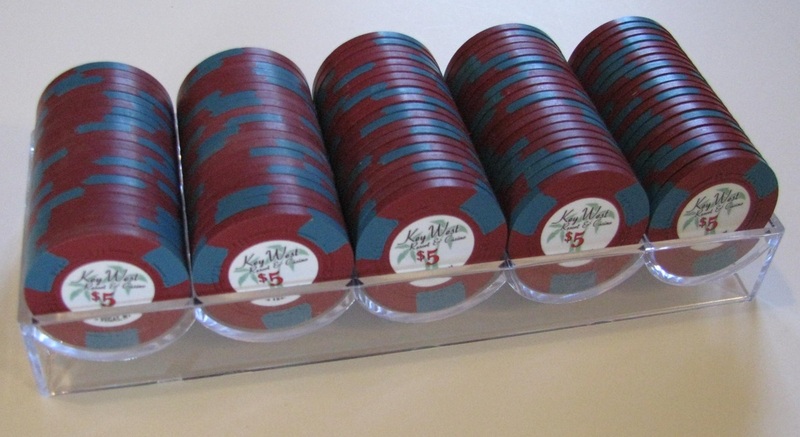 At the Key West Resort & Casino, there's no need to wonder if our casino chips, racks and carriers are correctly sized to use together. We've already tested them, and they are! Our 100-chip racks fit 100 Key West Resort & Casino chips, and the racks stack and fit into the acrylic locking 600-chip fill carrier and the 1,000 chip carrier.